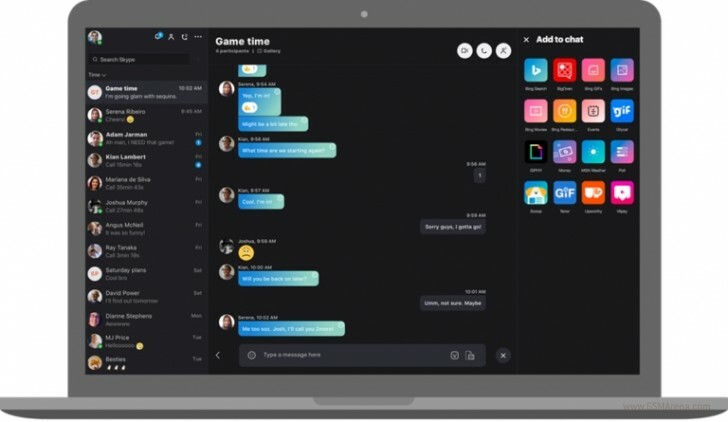 Today Skype is introducing a new look across its desktop apps for Windows, Mac, and Linux. This is in line with the latest redesign of the service's mobile apps. The new version of Skype for desktop has been in a preview state for a while, but it's now rolling out to every single user out there. It features customizable themes, and a chat list that can be organized by time, unread, or your contacts' status. Pinning people or groups means you always have them front and center. You can use a standard or compact view and collapse the chat list to focus more on the conversations. Skype is now lets you send files up to 300MB in size by just dragging and dropping, and it should use less battery power because it's cloud-based. Reactions allow you to easily let people know how anything makes you feel, while @mentions make it easy to get someone's attention in a group chat. Status updates are back, and bots should help you make plans and stay informed. The bell icon lets you access the notification panel which will show you what you've missed - reactions to your messages, @mentions in group conversations, or if someone quoted you. The chat gallery is there for quickly finding media, links, and files that have been sent in any specific chat. Skype for Windows 10 will be updated "shortly" with the new features. If you are using Skype on Mac, Windows 10 November Update (2016) and lower, Windows 8, Windows 7, or Linux and you have automatic updates enabled, you will receive the new version "when it's ready". Alternatively, you can go to skype.com and manually download and install this iteration.